Two Russian Bear long-range bombers flying close to UK airspace were intercepted by RAF Typhoon fighter jets, according to Britain's Ministry of Defence (MoD). 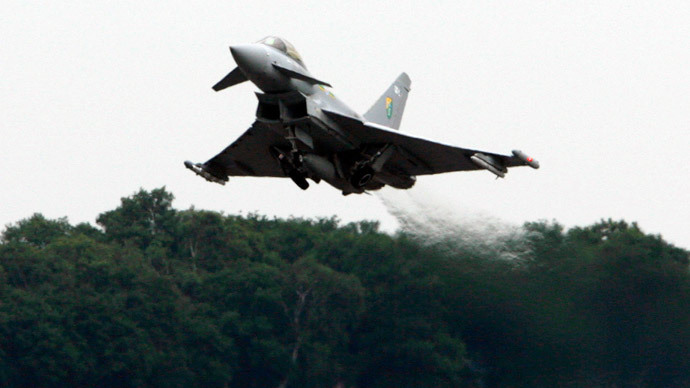 The Typhoons were scrambled from bases at Lossiemouth in Scotland and Coningsby in eastern England on Wednesday after the Russian bombers were detected flying over the Channel to the south of the UK, the MoD said. "The Russian planes were escorted by the RAF until they were out of the UK area of interest,” the ministry’s Thursday statement said, Reuters reported. “At no time did the Russian military aircraft cross into UK sovereign airspace." Later on Thursday, Britain said its civil aviation had been disrupted after Russian military planes flying near UK airspace forced authorities to divert civil aircraft. The country has summoned the Russian ambassador to explain why the long-range bombers flew over the English Channel, Reuters reported. "We summoned the Russian ambassador to account for the incident which disrupted civil aviation," a Foreign Office spokeswoman told the news agency. Two TU-95 strategic bombers (dubbed 'Bear' by NATO) have taken off from Russia's Engels air base on the Volga River on Thursday, and have successfully completed their tasks according to an air patrol plan, Russian Air Force spokesman Colonel Ivan Klimov said in a statement. The flight route passed above neutral waters of the Barents and Norwegian seas, as well as the Atlantic Ocean, the colonel said, adding that the flights lasted for over 19 hours, with two midair refueling operations carried out during the mission. The bombers were accompanied by Russian Air Force MiG-31 supersonic interceptor aircraft. At some stages, the patrolling aircraft were escorted by UK, Norwegian and French fighter jets, Klimov said. Russia's Air Force spokesman said that the air patrol flights were carried out according to an approved plan, and were conducted in strict compliance with international regulations of the use of airspace above neutral waters, without violating other countries' borders. NATO nations have been worried by Moscow having increased its air patrols near their borders. There were 100 intercepts of Russian aircraft in 2014 - three times as many as 2013 - according to British Defense Secretary Michael Fallon. It has been acknowledged, though, that Russia’s military flights were strictly in international airspace. Moscow explains the increase in air patrols near the borders of the NATO members as a response to the alliance beefing up its European presence in the wake of the Ukraine crisis. A NATO military buildup is listed among Russia’s major threats in to the updated version of the country’s military doctrine, adopted in late December. Russia’s Defense Ministry announced in November it was expanding its patrol missions of long-range aircraft to cover the Gulf of Mexico. “In the current situation we have to maintain military presence in the western Atlantic and eastern Pacific, as well as the Caribbean and the Gulf of Mexico,” Defense Minister Sergey Shoigu said.